The Marcoses asked PNoy for Marcos’s remains to be buried at Libingan ng Mga Bayani, with the honors due to past presidents, soldiers who die in the line of duty, other notables of the Republic. Pnoy could have tactfully declined the request, saying, ‘Don’t ask me, the son of Ninoy, of all people.’ That is what I wrote at the time. But for some reason, PNoy thought it was savvy to appear as if he had an open mind. So he entertained the request only to pass it on to Vice President Binay, who knows a hot potato when it lands in his hands. Binay said, let the people decide. This was good. He commissioned a survey. The survey showed two-thirds of Filipinos favor a Marcos burial in Libingan with full honors. With survey in hand, Binay set it aside. Not so good. Instead he offered to bury Marcos but only where he is already interred in Ilocos, with all the honors Marcos already got when he was first laid to rest there. 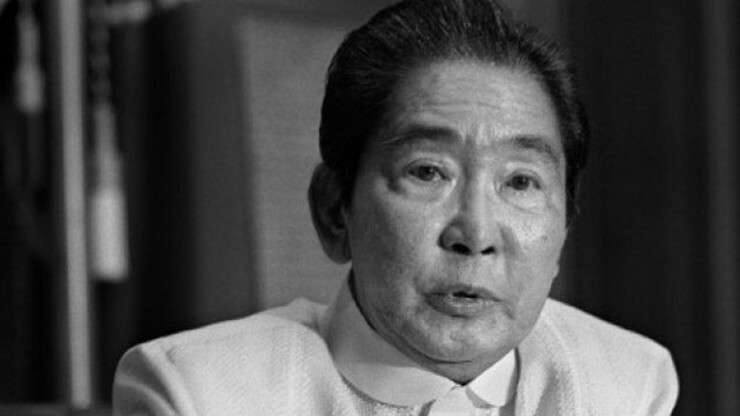 Late strongman Ferdinand Marcos Sr. This was a Solomonic decision, if you like. The late president gets everything he already got but nothing new. With this difference: the first time he was laid to rest aboveground, next time he will be interred underground. Out of sight, out of mind. The Marcoses did not know what to make of the offer. The offer has been rescinded. I think Marcos should be buried for what he was, a former president, twice elected in democratic elections. Oppositors say he destroyed Philippine democracy. That is not a disqualification. He was democratically elected president, twice. While he destroyed democracy, in order to save it, according to him, the people ratified martial law in a referendum. The Supreme Court validated the dictatorship as constitutional. So it was legal. Marcos was never impeached; he did nothing illegal to forfeit his right to be buried with other presidents not all of whom wanted to buried there. On top of that, after the assassination of Ninoy Aquino, the people elected two-thirds of Marcos’s candidates to the Batasan in the first relatively free elections since martial law was imposed. In short, it was tantamount to seeing two thirds ratifying the assassination of Ninoy. Is this unfair? No, it is fair and true. Ninoy’s assassination was the only raging topic of the day, with lightning rallies staged by the Left and joined by people with no connection to the largely mental and always inutile opposition in the non-left, particularly certain human rights advocates whose work did not make a dent on martial law. The military was all too willing to arrest the least guilty dissidents so they could be released on the recognizance of their human rights lawyers with no effect whatsoever on the longevity of martial law, and with some contribution to its credibility as a reasonable regime, especially abroad where the conventional wisdom was that anything Fellow Travelers opposed must be defended. The only real opposition to martial law came from the New People’s Army, along with the MNLF, which reduced support of the regime by every soldier they killed. The first real political opposition to Marcos and Martial Law came, first and throughout its darkest days, from the Mosquito Press of Joe Burgos (to be specific) and the clandestine Jesuit publication Signs of the Times. It started its crescendo—right after the deepest dark before the dawn—only with Jimmy Ongpin, who showed that a man can be rich, even lucratively employed by the Romualdezes (in Benguet which they have regained, I guess it was rightfully theirs after all) and yet risk it all, not for convictions which are cheap and everybody has them because they are tinged with self-advantage, but for country. I was there when Jimmy first spoke up and spoke out at, of all venues, the Where Else? discotheque of the Ayala-owned Intercontinental Hotel. The Ayalas were already in on the ground floor of the middle class revolution that the usual suspects in the anti-Marcos opposition did not have the credibility or the talent to mount, and which would take off on Ayala Avenue. These are the real heroes of the restoration of Philippine democracy: Joe, Jimmy and Jaime, and not the blowhards on the margins whose tenures in the post-Marcos, Cory government were marked by inutility, moral pretense, and a proclivity to graft that only increased in their subsequent careers in government. So let’s stop acting like children who will not admit their mistakes. Let’s face the fact that the loudest critics of the Marcos regime would rival its rapacity when their turn came, particularly in the PCGG. Just like PNoy cannot change history to give himself any part, let alone a leading one, in the anti-Marcos struggle—never having been a political refugee unlike his father and his mother, since he came and went from the Philippines as he chose—it is time we changed the false history of martial law and the anti-Marcos struggle to exclude those who now oppose the appropriate burial of the president whose dictatorship they did nothing effective to defeat. Let us stop acting like children. Because like treason in the Japanese time—a most appropriate parallel given today’s leading political personalities—Martial Law is integral to the Filipino experience and a key part of its heritage. It should not be tucked away in the far north. It should lie in state in full view of the nation that largely welcomed martial law, mostly supported it, and, only after 13 years and one assassination, rejected it because the dictator was anyway dying. But, what about the victims of martial law, like my father? Well, what about them? Dead and gone, my friends, dead and gone. More important, what about PNoy? In a belated change of heart redolent of bad taste, PNoy now says, flat out, that Marcos will never be buried in Libingan in his watch. Now he says it? Now? After stringing along the Marcoses and misleading two thirds of the Filipino nation that their opinion for or against a Marcos state funeral at Libingan mattered? The marching band in Ilocos is still practicing. With more tact and better taste, PNoy might have said what he should have said at the start, “No, don’t ask me, of all people, the son of Ninoy.” When will he learn from his mother? That is how Cory Aquino reacted when the same request was put to her, “Don’t ask me, I, of all people, the widow of Ninoy.” And the matter was never again raised with her. But PNoy never listens to unsolicited advice, as if it was a failing to do so. But unsolicited advice is the best kind because solicited advice only begets sycophancy. The Marcoses, on the other hand, should stop opening themselves up to insult. They should stop asking for something only they can give: the honors they believe due their father, which will be accorded properly only when one of them ascends to the office to which we Filipinos elected their father twice. Not that we had a choice when he ran for reelection in 1969 on his unimpeachable record of resistance against a candidate with a prison record for treason involving the same Japanese. He won by a landslide that no amount of cheating could account for. At that time, those who lived through the horror of Japanese-occupied Manila were still alive—and kicking those who had a good time during the Japanese time. Napoleon’s family waited for the right moment to properly honor his remains, standing back even as a spontaneous Bonapartism spread throughout French society and the army until his nephew staged a coup, killed a corrupt republic, and made himself emperor—remaking Paris, as Marcos tried to remake Manila, the most beautiful capital city in the world even today. Marcos would appreciate that. He told me, when we were discussing drafts of his first book, The Next Revolution: Democracy—his blueprint for the remaking of society through martial law—he presented me with the first two copies hot off the press—that he admired Napoleon for saving the French republic by destroying it. I know that this point of view, which is the right one, galls some. Well, suffer the gall and go on lying to yourselves about yourselves.